StormGeo believes the upcoming IMO DCS (Data Collection System) regulation can be a game-changer for shipping – enabling a more environmentally and commercially sustainable age of operations. However, according to the global leader in weather forecasting and maritime decision support services, vessels must harness the potential of continual route optimization to realize maximum benefits. IMO DCS data collection on 1 January 2019. It requires all vessel operators to report verified data relating to fuel consumption, with the goal of giving companies greater insights into fuel use and how to reduce it. The regulation sits alongside the EU’s existing MRV (Monitoring, Reporting and Verification) requirement, which logs CO2 emissions from individual vessels operating within and to and from the EU. “Taken together, these two mandatory requirements mark a significant step forward on the path to sustainability for our industry,” states Mike O’Brien, StormGeo’s Vice President of Products, Shipping. “The EU regulation makes emissions data from ships publically available, so stakeholders can review environmental performance, while the IMO’s act is a move to collect and analyze information from the entire industry. 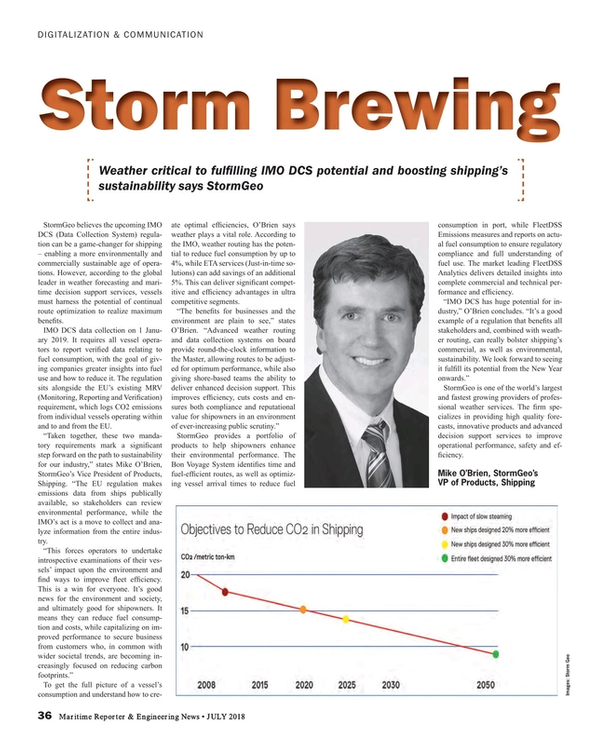 To get the full picture of a vessel’s consumption and understand how to create optimal efficiencies, O’Brien says weather plays a vital role. According to the IMO, weather routing has the potential to reduce fuel consumption by up to 4%, while ETA services (Just-in-time solutions) can add savings of an additional 5%. This can deliver significant competitive and efficiency advantages in ultra competitive segments. Image: StormGEO“The benefits for businesses and the environment are plain to see,” states O’Brien. “Advanced weather routing and data collection systems on board provide round-the-clock information to the Master, allowing routes to be adjusted for optimum performance, while also giving shore-based teams the ability to deliver enhanced decision support. This improves efficiency, cuts costs and ensures both compliance and reputational value for shipowners in an environment of ever-increasing public scrutiny.”StormGeo provides a portfolio of products to help shipowners enhance their environmental performance. The Bon Voyage System identifies time and fuel-efficient routes, as well as optimizing vessel arrival times to reduce fuel consumption in port, while FleetDSS Emissions measures and reports on actual fuel consumption to ensure regulatory compliance and full understanding of fuel use. The market leading FleetDSS Analytics delivers detailed insights into complete commercial and technical performance and efficiency. StormGeo is one of the world’s largest and fastest growing providers of professional weather services. The firm specializes in providing high quality forecasts, innovative products and advanced decision support services to improve operational performance, safety and efficiency.